Hubspot is a marketing automation software but also provides a free CRM to help companies doing sales. A lot of startups, small companies and even bigger ones, rely on Hubspot CRM (and their marketing automation). It is important for us to be part of that sales process. Why Connect Livestorm and Hubspot? By connecting Livestorm and Hubspot together you can send your registrants/attendees automatically to your sales pipeline, under a specific stage, create contacts or task notes. This is great to make sure that your sales team will follow up on the leads you generate via your webinars. First, you need to grab your Hubspot API key. You can just click here to get it. 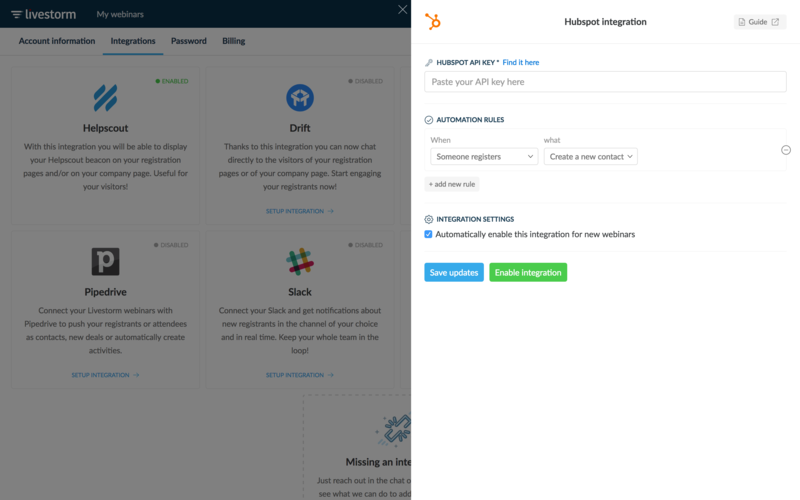 You can also go to your Hubspot dashboard, click on your profile to open the dropdown menu, click on Integrations and click on Hubspot API Key. Then, you can click on View key to grab your API key. Based on your attendees behaviour you can trigger specific actions in Hubspot. When someone registers. This will trigger each time someone registers to one of your webinars (via the registration page, the registration widget or Zapier). When someone attends the webinar. This will trigger only at the end of your webinars. The rule will fire actions for each registrant that has attended the webinar. Create a task note on a contact with the webinar details. *This means that this will update your contact if it is already in your Hubspot. If it doesn't exist yet, it will create it. Also, we will never override existing data. We'll just add information that is missing. When we create or update a contact or a company, we make sure to pass the data from your registration form as well. Meaning that if you use our preset fields such as phone, company, website, first name, name, etc., we will map those fields with the ones on Hubspot.